SingleSpeed Brewing Co. now open in Downtown Waterloo | Vandewalle & Associates, Inc.
UPDATED–NOW OPEN! The new SingleSpeed Brewing Co. brew pub and distribution center in Downtown Waterloo, IA has opened its doors wide to an excited public. The massive rehabilitation of the 1950s-era former Hostess Wonder Bread building has been years in the making–and is the latest in a series of transformational redevelopment projects that are ramping up the energy of Downtown Waterloo. The LEED-certified space boasts vast, re-imagined spaces, bike-themed decor, and imaginatively re-purposed nods to the original industrial decor. 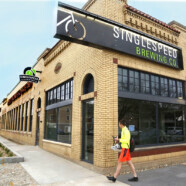 This is SingleSpeed’s second location in the Cedar Valley. The SingleSpeed Brewing Co. Waterloo facility has a capacity of 500, with seating for 300 along with an outdoor beer garden accommodating an additional 125. Read more in the Cedar Valley Business Monthly, and check out pre-opening WCF Courier images here.